We all know that person, the upbeat optimistic type who loves life and slays monsters…OK maybe not. From the Blood franchise, begun by the anime film Blood: The Last Vampire, comes another anime series. Separate from those that came before, it explores the concept of friendship, the nature of self and the conflict between monsters and a schoolgirl. 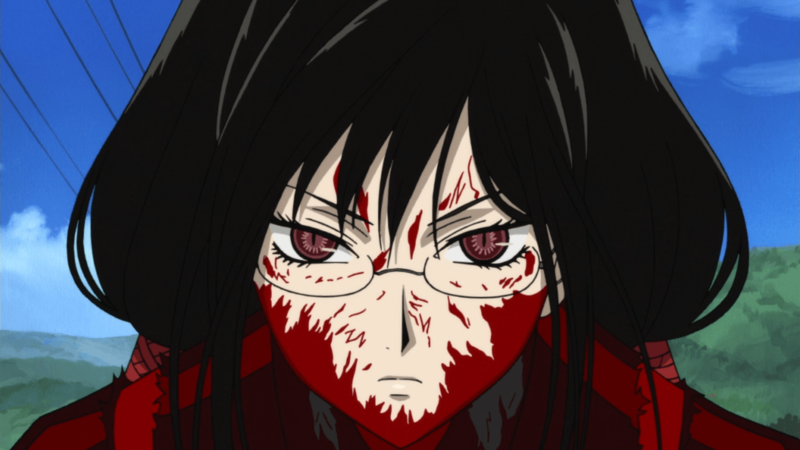 Blood-C centres around high school student Saya Kisaragi, who is the definition of innocence and sweetness. Clumsy, excitable and somewhat oblivious, she enjoys her life to the fullest. Sunshine and puppies…Oh and monsters. Terrible, twisted horrors that appear and slaughter humans. Saya, like her mother before her, has inherited the Sacred Blade and along with it the task of slaying the creatures known as Elder Bairns. She alone wields the power to fight the monsters and protect her village. As the series progresses, the Elder Bairns begin to appear stronger and in quicker succession, beginning to destroy the idyllic lifestyle Saya has enjoyed. 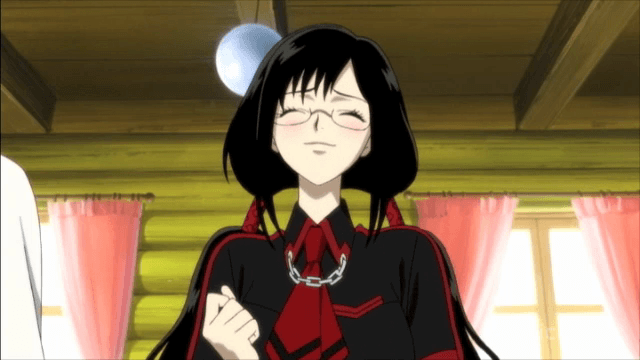 Saya’s development over the course of Blood-C is noticeable. As the war against Elder Bairns rages on, her psyche is affected more and more. Her secret begins to impact her daily life and schedule. Without going to far into spoiler territory, Saya begins to learn the more information regarding the conflict between humanity and the Elder Bairns as well as receiving visions of conflict and combat. She progressively unlocks the truth and shifts further from her happy-go-lucky nature, though she still does retain her overwhelmingly compassionate demeanour. Her more aggressive side is prevalent in her fights, where her eyes will shine red and her combat style becomes much more brutal and effective. The series itself has a slow burning plot, though it begins slowly it continues to build momentum until the very end. The final two episodes, being the culmination of the story, are naturally the fastest paced and contain the revelations of the series. Blood-C leaves on an open ended note, with continuation set in the film Blood-C: The Last Dark, which should bring resolution to the saga of Saya and the Elder Bairns. As you watch Blood-C you’re going to see blood and a lot of it. Flesh wounds are akin the blood geysers in this series and it just escalates from there. The fight scenes are intense to say the least. Creatures lose limbs by the dozen, though some have plenty to spare, not that it slows them down horribly. There are also some very graphic scenes involving those unfortunate enough to stumble into an Elder Bairn (Spoiler: It doesn’t end well for them). The Elder Bairns themselves also have a very unique and twisted style. Every single one of the Lovecraftian horrors is completely different in style from the ones that came before. This provides very interesting visuals that don’t repeat the visuals or actions of previous conflicts. Though in the end each and every monster bleeds, a lot. The brutal action is aided by the fluid animation, expressing the speed Saya needs to survive against her larger foes. The general background music used throughout Blood-C is very orchestral and intense, used to great effect in her fights with the ancient evil of the Elder Bairds. The music expresses a sense of drama and at often times fear. The violin shrieks just as easily convey terror as they do the epic nature of the enemy. On the lighter, and more involved side, of the soundtrack it Saya herself. In near every episode, Saya sings a song on her way to school, noting the brightness of the day and her joy for life in general. This does an excellent job of further expressing Saya as the bright and bubbly schoolgirl she primarily is. Her continuation with singing also subtely questions her character, being one who can remain so innocent even after the horrors she is forced to witness. During the final episode, this normally upbeat song is slowed down considerably and used to set the mood for one of the more sombre themes. This amplifies the intensity of the moment whilst also adding a personal touch, connecting Saya to the sounds of the series itself. The English voice acting was also done well. Characters showed emotional range, definitely sounding terrified when regarding the appearance of Elder Bairns. Although some characters had a somewhat monotone voice it was more in regards to the characters themselves, rather than the dub cast. Special mention goes to Alexis Tipton, the voice of Saya, for convincingly expressing the myriad emotions of the protagonist. 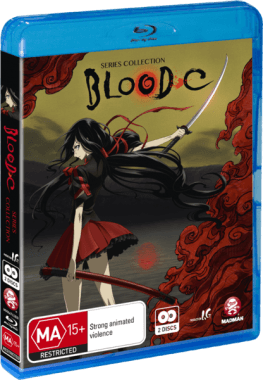 The Blood-C Series Collection contains the usual extra features for a release. The trailers and promotional videos for the series, both the original Japanese TBS commercials and the trailer for the series collection itself, are included as well as trailers for other series. The textless versions of the opening and closing themes, “Spiral” and “Junkestsu Paradox” respectively, are also included. 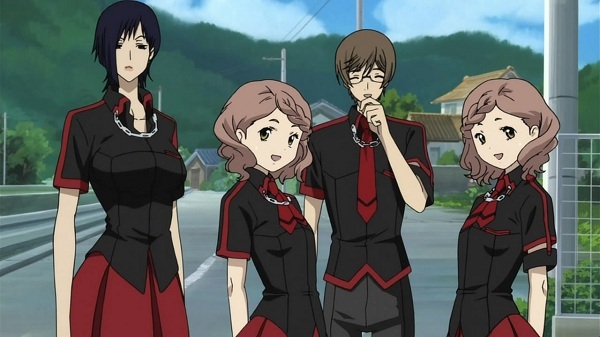 Commentary is also provided for episodes 6 and 12, featuring series director Jerry Jewell for both as well as English voice actors Robert McCollum (Fumito Nanahara) for episode 6 and Alexis Tipton (Shaya Kisaragi) for episode 12. Blood-C is a series that takes a while to warm up, but when it does boy does it burn. As the plot begins to reveal itself and slowly creep in on the seemingly peaceful village, the violence becomes more prominent. The series does teeter towards a general “secret highschool hero” type series early on, but it comes into its own at the end. Somewhat unfortunate that the series wasn’t as powerful as the finale the entire way through, but it nonetheless sets up the big reveal. Definitely an interesting series to watch and one that truly shines as it comes to a close. The finale is left open and definitely leaves a desire to watch Blood-C: The Last Dark and finish the story of Saya Kisaragi.